Yes, automating your documentation can reduce drafting time spent by you and your employees by 70%. That said, prior to beginning the process, it’s important to evaluate just which types of documents are best suited for automation. In fact, the process starts a few steps before approaching the Legito editor, or any other for that matter. Have a look at what I’ve learned from years spent advising our customers on automating their own documents in Legito. What should you do before you begin automating your documents? Document automation isn’t free. It’s an investment that has to be returned. + In addition, it also helps you keep your knowhow in-house, which decreases the resources needed to onboard new employees. Like any investment, devoting resources to document automation needs to make sense. That’s why it’s important to evaluate which types of your company’s will provide the greatest return after automation. This is very individual and depends heavily on a company’s specific legal needs. How often does your company use it? How many different wording options does it need to contain? Depending on the length of the document, automating a single option of a document’s text (e.g. a contract for a fixed period or a permanent contract) can save you anywhere between 1 min and 1 hour. This is why using those three criteria above can really come in handy as you decide how (and where) to invest your resources in automation. I intend to automate a Power of Attorney. Automating it myself would take 3 hours of my time, or alternatively I can spend one hour of my time and 100 Euro to have it automated for me. saved per year on drafting Power of Attorney. The return on investment (ROI) in this case is very slow, making it unsuitable for automation. I intend to automate an Employment Contract. Automating it myself would take 20 hours of my time, or alternatively I can spend 10 hours and 300 Euro to have it automated for me. saved per year on drafting Employment Contract. Return on investment (ROI) in this case is very fast, so automating this file makes complete sense. This is a simplification of the concept and there are additional factors that influence the viability of automating a document. These include translation (bilingual documents), mass generation (e.g. increasing the salaries of 300 employees at once) or if your documents contain calculations (e.g. business offers or financial documents). Take a look at several recently created examples (10-20) of the documents you intend to automate. Such research helps you understand what changes you have been repeatedly making to a document. These places of repetition are exactly the parts of your document that are best for automating. To find changes in your documents faster, I recommend using the “Compare” feature in Word. You can skip this step if you already know what options you want to automate. The third step is to visualise all options you intend to automate in a mind map. You can easily create such a map for free using Coggle. 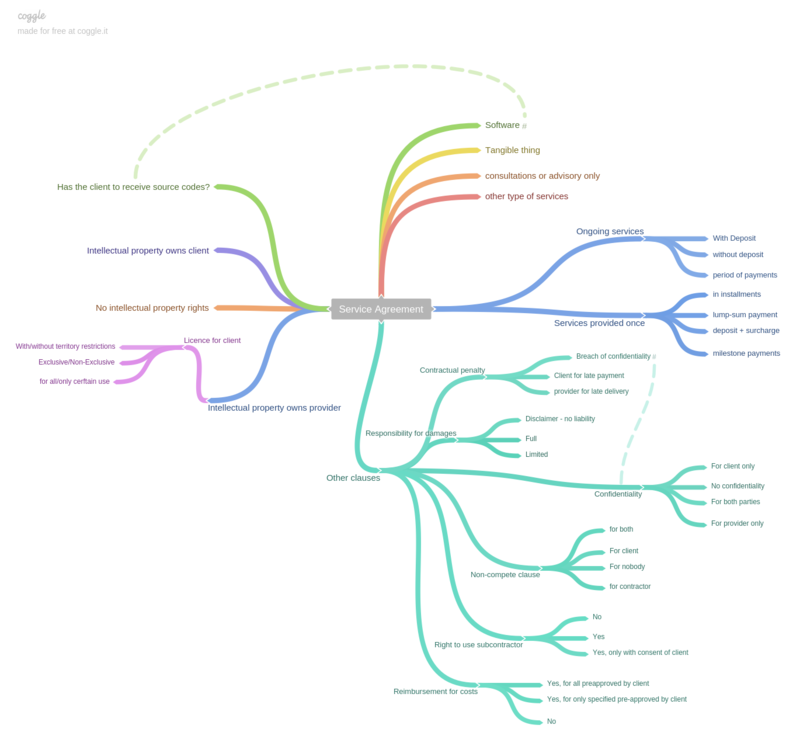 Example of mind map for document automation. Click at the picture to get the mind map in full size. Of course, if you don’t like mind maps, there are many other ways to summarize the options to be automated. Now it’s time to automate your template in Legito or any other tool. If you would like to outsource your automation to us or any other specialists, you will need to draft a Word template with instructions for all the options in a mind map. Example of Word template for automation in Legito. Click at the picture to get it in full size. Think your company can benefit from automating some of its document drafting? You can find more information on our document automation page or, better yet, let’s talk about it! Just drop me an email at ondra@legito.com.